How can policies be normalized and consistently enforced across multiple services? Policies that apply to multiple services can introduce redundancy and inconsistency within service logic and contracts. 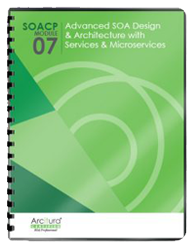 Global or domain-specific policies can be isolated and applied to multiple services. Up-front analysis effort specific to defining and establishing reusable policies is recommended, and an appropriate policy enforcement framework is required. Policy frameworks can introduce performance overhead and may impose dependencies on proprietary technologies. There is also the risk of conflict between centralized and service-specific policies. 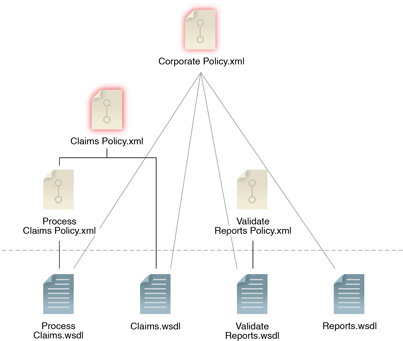 A global policy definition (Corporate Policy.xml) is established and applies to all WSDL documents, and a further domain policy (Claims Policy.xml) is created and linked to two WSDL definitions. This new policy structure eliminates redundancy of policy content and ensures consistent policy enforcement.